The Kufstein region, nestled in the Zahmen and Kaiser mountains, is the Eastern entrance to the Tirolean Alps. It’s located around the town, Kufstein. 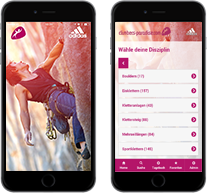 Climbers will get their money’s worth – with more than 40 tours through the Kaiser mountains in all difficulty levels. There are several family-friendly areas or more challenging climbing gardens, via ferratas, interesting multi pitch routes in the Sparchen climbing area, two climbing gyms as well as a climbing sculpture. Another recommendation is hiking through the picturesque Kaisertal valley, which was voted as Austria’s most beautiful place in 2016. If you don’t want to go climbing or hiking, the area has a lot more to offer – both in summer and winter: from great mountain biking routes, about 300km running and walking trails, six crystal clear lakes, six adventure indoor and outdoor baths, canyoning, skiing and cross country skiing in and around the Kaiser mountains, snowshoeing to tobogganing, you can do just about anything. The Kufstein region is popular for its culinary, cultural and traditional alignment. All in all, the region is versatile, inviting and individual. Kufstein is located next to the green Inn river and fascinates by its historic-urban flair. You can stroll through dreamy alleys in the old town – particularly the Römerhofgasse alley – or visit one of the many cafes or bars in the modern center of the city. Center and landmark of Kufstein is the historic fortress, built on a hill. You really shouldn’t miss visiting the fortress! Around Kufstein, there a eight picturesque villages: Bad Häring, Schwoich, Langkampfen, Thiersee, Ebbs, Niederndorferberg, Niederndorf and Erl. They are all popular for different things: a source for health, a Haflinger stud or an adventure park. They all guarantee diversity and individuality! Make sure you visit the Kufstein fortress on a hill in the middle of the town! It is considered as one of Tirol’s most important historical memorials. It has a great adventure world as well as a magnificent view over the Kufstein region. Stand-up paddling on the Inn river or one of the natural lakes – a unique experience! Take the Kaiserlift cable car to get from the Kufstein town into the surrounding mountains, the Kaiser mountains. The foal farm in Ebbs has regular Haflinger horse shows. It’s the oldest Haflinger stud in the world and guarantees a fun experience for both old and young! The Kufstein region is popular for its regional products and handicrafts.